Filipino Chicken Adobo, a delicious chicken recipe that is super easy to make with just a few ingredients. 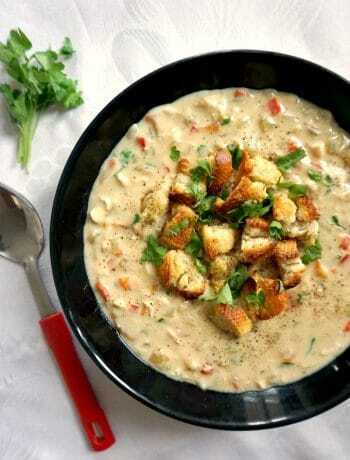 Serve it with rice, salad or any other side of your choice, and enjoy the best homemade dinner tonight. A low-carb, high-protein, low-cal, super healthy recipe that will make you lick your fingers clean. Adobo is a popular dish and cooking process in the Philippine cuisine that involves meat, vegetables or seafood cooked in a sauce made from vinegar, soy sauce and garlic. The recipe is considered by many people the sample food of Phillipnes. And rightly so, as it is so tasty and easy to make. The key is to leave it to marinate, ideally overnight, or as long as you have time. And be generous with the amount of garlic you use, the more, the tastier. Which is fine by me, as I love garlic, waay to much!!! How do you cook easy chicken adobo? 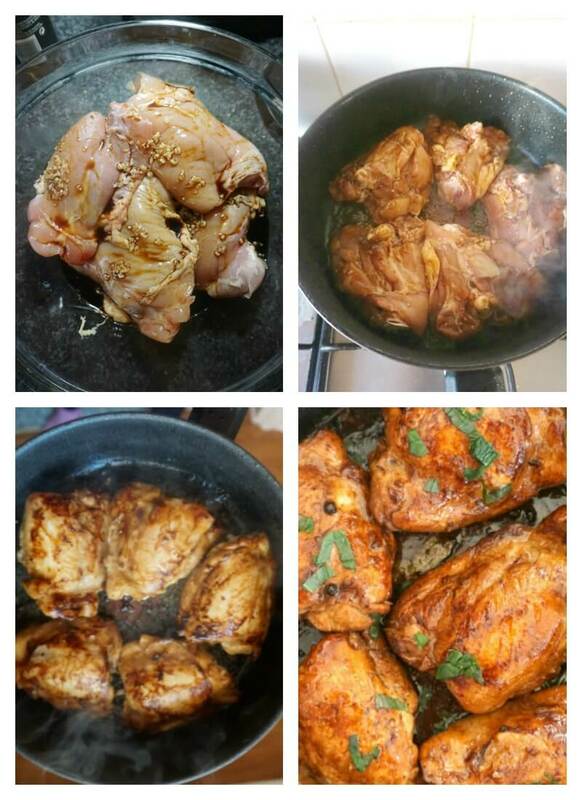 I chose to cook chicken, as it is a light and easy meat that many people love, including little ones. Most recipes call for a whole chicken, but l decided to go for chicken thighs only. I know that chicken breast is everyone’s favourite, including myself, but l think we should give the thighs a chance too. Not only they are a lot cheaper, but also tastier. And I find that the meat does not dry out so quickly like breast does. Unless, of course, you use a nice sauce that keeps it nice and moist. Like my Baked honey mustard chicken with a touch of lemon, which continues to be my most popular recipe on the blog. Now, there are lots of different cooking methods for adobo, and I think there is no right or wrong, you just choose the way that you like best. And I chose the easy way where everything is cooked in one pot. Don’t you like less mess? in a bowl, combine the vinegar, soy sauce and minced garlic, add the chicken thighs and leave to marinade, ideally overnight. 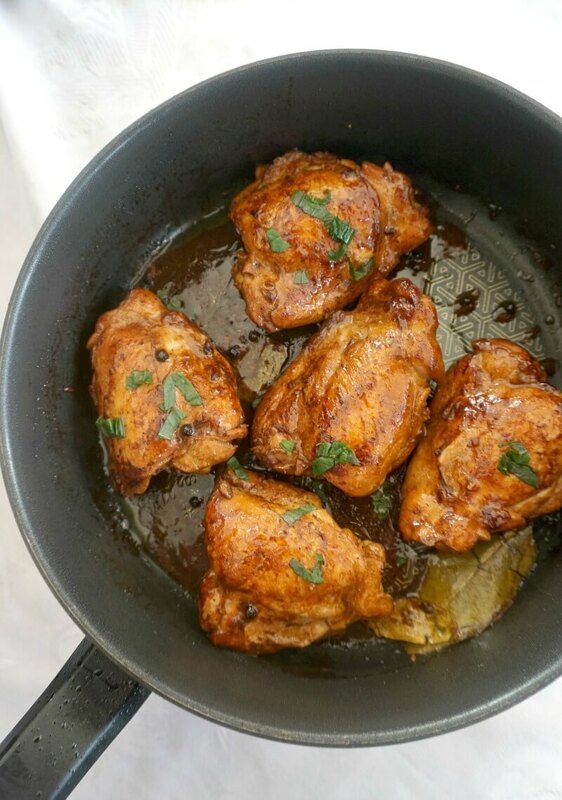 heat up the oil in a pan, add the chicken thighs, and fry gently until brow. The chicken won’t be cooked through at this stage. add the chicken stock, marinade, peppercorns, bay leaves, cover the pan with a lid, and leave to cook until the chicken is tender and the liquid is reduced into a thick sauce. Is the adobo sauce too strong? I must admit that I was a bit reluctant at first, was unsure whether I would like the adobo sauce. And that is because it uses quite a bit of vinegar. I thought the flavour would be too strong and the sauce too sharp. But, surprisingly, it is the very best sauce I have ever tasted. You really cannot tell that is has that amount of vinegar. Yes, it is slightly sharp, but it has the right amount of vinegar. The base of the adobo sauce are vinegar, soy sauce and garlic. Nothing simpler. Not tastier. If you’ve liked my EASY FILIPINO CHICKEN ADOBO RECIPE or any other recipe on the blog then don’t forget to rate the recipe and let me know how you got on in the comments below, I love hearing from you! You can also FOLLOW ME on FACEBOOK, and PINTEREST to see more delicious food and what I’m getting up to. 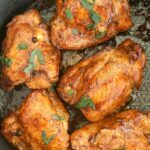 Filipino Chicken Adobo, a delicious chicken recipe that is super easy to make with just a few ingredients. 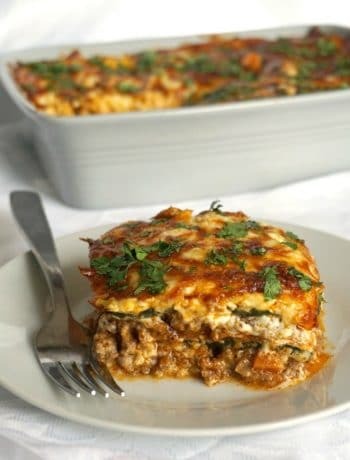 Serve it with rice, salad or any other side of your choice, and enjoy the best homemade dinner tonight. To make the marinade, add the soy sauce and cider vinegar to a bowl together with the minced garlic and mix well. 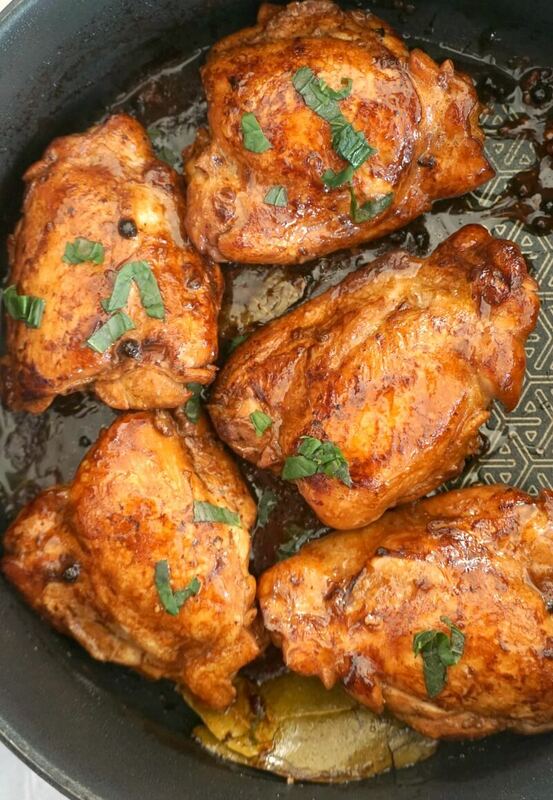 Place the chicken thighs in a large dish and pour over the marinade. Cover with clingfilm and refrigerate for at least 1 hour, so that the chicken can soak up the flavours. Remove the chicken from the dish and retain the marinade. In a large frying pan, heat up the oil and add the chicken thights. Fry slightly on each side until lightly brown. Add the marinade, peppercorns, bay leaves and chicken stock, and leave to cook with the lid on until the chicken thighs are cooked through and the sauce is reduced and slighty thickened. Serve the chicken with rice or the side dish of your choice, pouring over the remaining sauce. Being Filipino, I grew up enjoying many variations of adobo from different family members. It’s always delicious! Yum – now I am craving it! Chicken thighs are underrated. They are so juicy and full of flavour. This dish sounds very tasty. Love the sauce…and the heat!! I love Abodo chicken rice. I’ve eaten it a few time while in Singapore. That sauce looks so delicious. I didn’t know it was so easy. Can’t wait to try this. Thank you, Veena! I’m sure you’ll love it! I love cider vinegar so I’m pretty sure I would like that adobo sauce. Sounds really good and like it would be great with lots of things. This chicken looks amazing! I’ve got some thighs thawing in the fridge. I just might mix up this marinade to use on them. I love how simple the marinade is! Thank you! I am sure you will love it! That chicken looks delicious, I haven’ t tried adobo sauce, may be I can give it try. They sound have both tangy and salty balance from soy sauce and vinegar. I am Filipina and certainly proud that this is our national dish!! 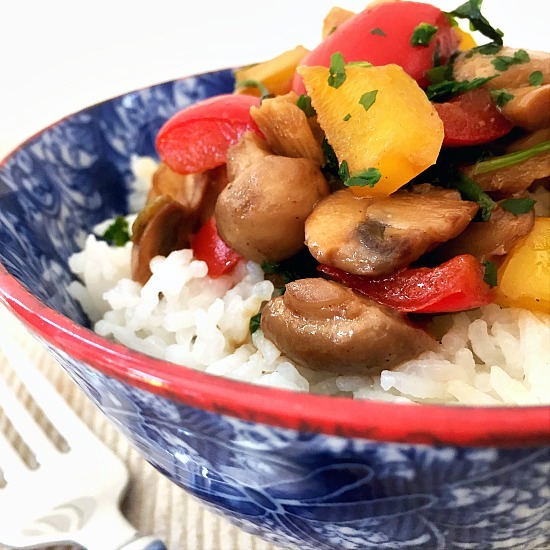 Chicken adobo is amazing indeed – so tasty yet so easy! I have so many versions of it, too. Have to try this with parsley as you suggested. Looks so yummy! Thank you, glad to see that you approve of it! This recipe looks so delicious! Perfect for dinner! Saving and hope to try it out soon. This is the second time I have to write this because it is saying I’m spam — I”m not. I did say that your chicken adobo sounds and looks great. We make our own adobo sauce so we are ready to make it this week. Going to try this now. Sounds delish. Will let you know. Thank you! I hope you’ll enjoy the dish!